The photograph shows the corpse of a one year old boy who died of dehydration being wrapped up in white shroud according to the Muslim tradition. His family, originally from the northern part of Afghanistan, sought refuge because of the political situation in their country and because of the drought which deprived them of food. 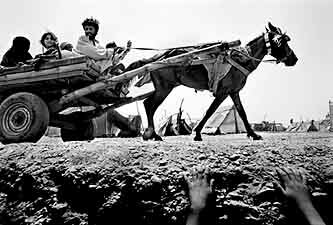 A horse and cart convey a family in the camp. Nearly one fourth of the world's refugees are from Afghanistan, mainly in the neighbouring countries of Iran and Pakistan. 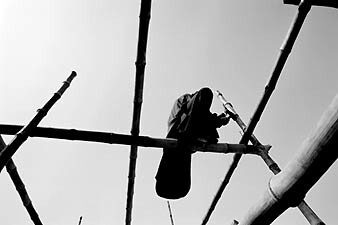 A refugee carries out construction work in the compound run by Medicins Sans Frontieres. A crowd of refugees wait for food. 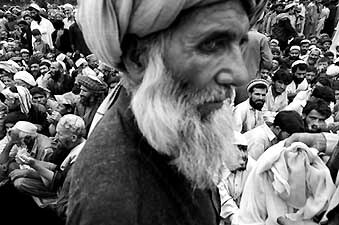 In June 2001, 90.000 Afghans fled across the border to Pakistan because of war and the worst draught in 30 years. Pakistan already had 2 million refugees and refused to accept more. The refugees were living in appalling conditions and according to international relief agencies the situation could become a humanitarian catastrophe. 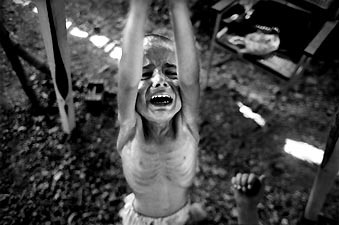 An undernourished boy holds on to a weight while being checked in the MSF clinic. The MSF was at that time the only organisation in the Jalozai camp providing the refugees with water and medical treatment. 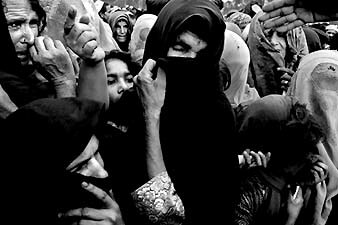 Women refugees gather seperately from their men wait under a fierce sun hoping to get some food. They are dependent on voluntary donors for their next meal who occasionally send a few trucks with vital supplies. 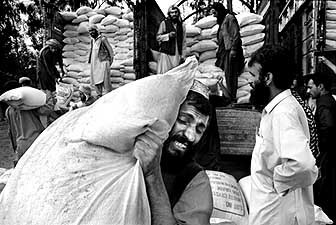 Trucks laden with rice sent by a private donor to help the suffering refugees. Thousands crowded near the trucks but only the lucky ones got some food. Pakistan security guards beat back the hungry and desperate crowd to stop them from attacking the trucks. 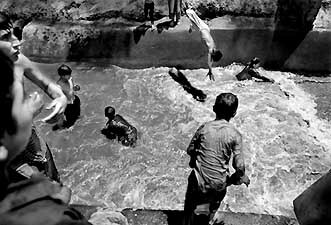 Close to the camp, a group of children play in waste water from the city of Peshawar. In the summertime, temperartures can reach up to 50 centigrade. 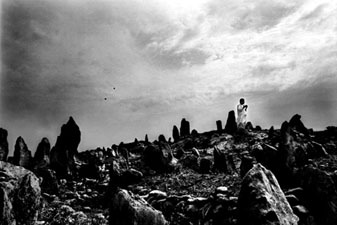 A man prays in a makeshift graveyard in the dry landscape outside the refugee camp. Rocks are used as tombstones and the graveyard has continually grown with the increasing flow of refugees. Discussing the winning picture, the president of the World Press Photo 2001 jury, the British photojournalist Roger Hutchings said that the judges had favoured the fact that it had been taken before September 11th. The jury wanted to avoid having to choose from one of the no doubt thousands of apocalyptic hard news pictures on offer of the terrorist attack and the subsequent reprisals. Once again, this seems to be a decision with a strong political message. September 11 was a news event unequalled in recent history but the jurors wanted to turn our gaze away from the playing out of international conflict and concentrate it on the experience of innocent people caught up in these power games.